Only an hour away from the coast and things began to change dramatically. The temperature began to rise and there wasn't a cloud in the sky. The air and landcape became parched and the trees disappeared the further inland we went. the rivers and creeks became completely cracked and dry. Distances between towns were vast and the roads lengthened, stretching for miles without even a hint of a bend. Vehicles were so few and far between that everyone greeted each other with on over-zealous outback wave. The majority of vehicles we passed were the renouned road trains. These are basically massive, powerful trucks pulling 3+ carridges and more than 50metres long. At full pelt they can take up to 3km to stop and you don't get in their way. We were only allowed to travel until 6.00pm as thats when the roos come out to play. The numbers seen dead on the sides of the road tell the story. We spent most nights in the incredibly well maintained free rest stops along the way. These usually consisted of a big dirt patch just off from the main highway with a fire/BBQ area, sheltered picnic table, water tap and occasionally a toilet. We cooked dinner each night on our camp stoves and when we needed a shower we pulled into the roadhouses and had one there - usually for free, It was awesome. As we continued further the towns marked as the only feature and goalposts on our map(a tiny black dot) hundreds of km's apart, became not towns at all but merely one building with fuel, food, basic supplies, bar etc all under one roof. Fuel prices soared (although still much cheaper than at home!) The main highways were paved but all the adjoining roads were dirt track suitable for 4x4's alone. For three hole days we drove solidly west. As we got deeper into the outback the dusty ground turne dthat awesome vibrant red colour. It was incredibly barron and we passed a?few blackoned areas that had been dessicrated by bush fires, some were still smouldering. Our first point of interest on day four was called the?Devils marbles. An impressive sight of huge bright red coloured granite boulders, that looked like they'd just been dropped out of the sky. We camped on sight, catching the incredible lighting effects at both sunrise and sunset. We spent the evening out on Jims roof?staring at the most star cluttered sky i've ever seen. The next day we reached Alice springs - the gateway for trips to Ayres rock despite being still 400km's away. We spent our time here completely out of sinc, before realising the clocks had changed, and we're still not sure at what point. Before Ayres rock we visited the lesser heard of but equally awe inspiring Kings Canyon. We took the three hour walk around the canyon rim. We left really early as temperatures were reaching 40degrees + at midday. the scenery was awesome - Bright red sheer cliff faces, deep revines, cracks and crevices and procarious overhangs. The only downside was the pesky flies. They are such a menace in this area and have been driving us mad. I have never known flies like it. They didn't just fly around you like the ones at home. No. These were determind to get into any orafice. Up your nose, in your ears and under you sunglasses. I ended up flicking my pony tail like a horse. We were glad to be back on the road, this time heading for the rock. We could see it in the distance remarkably soon, from 150kms in fact. 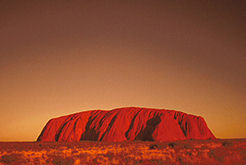 After all the excitement it turned out not to be Ayres rock at all, It was mount Conner - false alarm. then we really could see it, and knew we were right this time. There was no mistaking the familiar shape. it stands out like a sore thumb. A huge piece of rock in the middle of complete, flat nothingness. We joined the masses at sunset and sunrise to see it turn from oranges to deep reds, something about it was totally mesmorising. Tom and I had a bottle of sparkling mango wine, which we bought at a farm on the way down who use mangoes as its too hot to grow grapes. It was delicious. The next few days saw us heading south towards Adelaide. We spent one night at an opal mining town called Coober Pedy, where it gets so hot that the majority of the poulation live underground. we had a great expierience camping in an underground campsite. The cave was divided into sections. You just chose a section and slept on a matress on the stony ground. Awesome - apart from the two snoring men echoing around the cave like thunder all night! By now we were getting the off-road bug. We weren't supposed to and Jim wasn't a 4x4, but there was an fantastic track we'd been reccommended over and over so we decided to give it a go. 15kms in, and the road was so corrugated that we thought Jim's windows were gona shake in. We turned back, defeated. Although we did get to see the dog fence. Which stretches 5300kms across oz, to stop the native dingoes from getting into the sheep country in the south. The next day we reached Adelaide, back on the coast and feeling the cold.